Tripping and Stumbling while following Jesus: Prophets "Outside" the "church"
So this fellow dies. He goes up to heaven where St. Pete shows him around. St. Pete asks the guy what he'd like to see of heaven first. The fellow responds, "Well, I was a musician. So I guess I'd like to see all of the famous musicians that you have up here." St. Pete takes him to the area where all sorts of musicians have their heavenly mansions. They're both walking down the streets of gold, as the newly arrived soul marvels at all of the sites. "Oh, wow, there's Elvis!" says the fellow. "Ooo look, Jimi Hendrix...and Stevie Ray Vaughn." The new guy is amazed, and St. Pete gets a kick out his excitement. "Oh man, Johnny Cash is jamming with Carl Perkins. Holy smokes, even Bono is here," exclaims the excited newbie. "Wait, WAIT...Bono's not dead!," he realizes. St. Peter replies, "That's not Bono. That's God. He just thinks he's Bono." make paths straight for him." John's clothes were made of camel's hair, and he had a leather belt around his waist. His food was locusts and wild honey. People went out to him from Jerusalem and all Judea and the whole region of the Jordan. Confessing their sins, they were baptized by him in the Jordan. But when he saw many of the Pharisees and Sadducees coming to where he was baptizing, he said to them: "You brood of vipers! Who warned you to flee from the coming wrath? Produce fruit in keeping with repentance. And do not think to yourselves, "We have Abraham as our father." I tell you that out of these stones God can raise up children for Abraham. The ax is already at the root of the trees, and every tree that does not produce good fruit will be cut down and thrown into the fire." Rick McKinley has a great sermon about John the Baptist. He points out accurately that John would not be the most pleasant guy to hang out with for a prolonged period of time. Essentially, Jesus' crazy cousin from the hills would come off as one of those street preachers that get under people's skins, and whom we tend to say causes all the problems for other Christians. And yet, John was absolutely necessary to prepare people to hear the gospel that would arrive shortly there after. Crazy prophets who bug & annoy people, and say all sorts of controversial things do seem to have a place in God's kingdom. So last night, U2 had it's concert in a new outdoor stadium here in the Twin Cities. Really wish I could have been there. I've seen them three times, and they never disappoint. We also had a huge storm in the cities last night. Apparently, the concert got soaked...but they kept playing. (Not sure how they do that with out getting electrocuted.) A friend told me that in the middle of the storm Bono started "Singing in the rain." U2, and Bono in particular, get a lot of flack about their outspokenness. Bono catches the majority because he has a big mouth and is involved in so many causes. I have noticed that he tends to get a bit of flack from many in the "Christian" world. The irony is that, as near as I can tell, he has a passionate love for the Jesus of the gospels...although certainly not in the conventional sense. Anyway, Peterson prefers Classical music to modern rock. But he has tremendous respect for a band like U2, especially the massive amount of charity & social justice work that they do. Here is a link to an interview that he did. I'll only quote from a section that really stood out for me...and should for anyone who is perplexed by modern prophets. "A prophet, almost by definition, doesn't fit into the categories you expect, which is what gives them bite, and clarity, and the sense of grabbing us by the scruff of our neck, and saying, "Listen to this: this is truth, this is what's going on." The whole authority of prophets comes not from what people say about them or the credentials that they have, it's from the truth of what they are saying. This is true of the Biblical prophets and of prophetic voices all through history. Often prophets use the name God but sometimes they don't. It is interesting to reflect that no Hebrew prophet ever was referred to as "messiah," but the pagan Persian king Cyrus was. (Now THAT'S interesting) God used him in what I would refer to as a prophetic way to free the Hebrews from their exile and return them to their homeland, but Cyrus had no idea that he was issuing edicts under the sovereignty of God. It is my job as a pastor and professor to speak the name of Jesus and proclaim the news of the gospel into whatever reality the prophets expose and call attention to. If they also do it, that's fine, but if they don't that doesn't mean that they aren't speaking/acting on God's behalf." Do you think a prophet loses something if he or she were to become "churchified" in some way? Yes, I think so. I guess he'd lose the edge of surprise. I've been a part of the institution of religion all my life and have been quite happy doing it. I felt that's what I was called to do. But I depend for a lot of my insights and language on people who are outside the Church. That doesn't mean they are outside of Christ, but they are outside of the conventional expectations. I need that. If I'm just around people who talk the way I do, I lose perceptive accuracy, sharpness. And I think Bono is doing that for many. If you are so inclined, here is the full interview that I watched. It's a very, very good interview...but also 30 minutes in length. Now I know what some may say. "Yeah, Bono does some good work, and says some nice stuff about peace & love and such. But that doesn't make him a Believer." Fair enough. For the record, I don't want to get into an argument over signing or reciting a specifically selected confession of faith. Frankly, embracing faith through mere intellectual ascent only gets you so far. I've been burned more times then I can now count by folks who signed the right confession of faith, but still produced no fruit in keeping with repentance, to settle for simply that argument. That having been said, a number of years ago the French journalist Michka Assayas wrote a book with Bono. Actually, it was simply a prolonged conversation that they had. The covered a number of topics, but also the areas of Bono's faith. So, for the record, and in his own words, here is what Bono has to say about the importance of Jesus in his life. http://www.christianitytoday.com/ct/music/interviews/2005/bono-0805.html <--- You can read the full article from Christianity Today at that link. Bono There's nothing hippie about my picture of Christ. The Gospels paint a picture of a very demanding, sometimes divisive love, but love it is. I accept the Old Testament as more of an action movie: blood, car chases, evacuations, a lot of special effects, seas dividing, mass murder, adultery. The children of God are running amok, wayward. Maybe that's why they're so relatable. But the way we would see it, those of us who are trying to figure out our Christian conundrum, is that the God of the Old Testament is like the journey from stern father to friend. When you're a child, you need clear directions and some strict rules. But with Christ, we have access in a one-to-one relationship, for, as in the Old Testament, it was more one of worship and awe, a vertical relationship. The New Testament, on the other hand, we look across at a Jesus who looks familiar, horizontal. The combination is what makes the Cross. Bono But I love the idea of the Sacrificial Lamb. I love the idea that God says:"Look, you cretins, there are certain results to the way we are, to selfishness, and there's a mortality as part of your very sinful nature, and, let's face it, you're not living a very good life, are you?" There are consequences to actions. The point of the death of Christ is that Christ took on the sins of the world, so that what we put out did not come back to us, and that our sinful nature does not reap the obvious death. That's the point. It should keep us humbled… . It's not our own good works that get us through the gates of heaven. 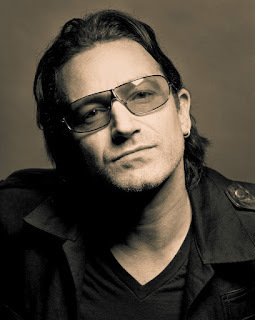 Bono: … [I]f only we could be a bit more like Him, the world would be transformed. …When I look at the Cross of Christ, what I see up there is all my s--- and everybody else's. So I ask myself a question a lot of people have asked: Who is this man? And was He who He said He was, or was He just a religious nut? And there it is, and that's the question. And no one can talk you into it or out of it. To me, that sounds a lot like a Billy Graham crusade with some strong language thrown in. I'm never really sure what people want or expect from other Christians/Believers. Far too often it is some religious code phrase or hair cut...with plenty of Americanized mythology thrown in for good measure. I'm not sure how you'll get that out of an Irishman. John the Baptist, Jesus, Paul, Peter, and John all pointed out that who have to look for the fruit. Mere words/code phrases aren't enough. The Pharisees & Sadducees had plenty of those...and they ended up as kindling. P.S. A few years back, Bono was asked to speak at a Presidential Prayer Breakfast. He took the opportunity to speak about the opportunity to serve the poor through the international ONE campaign. I found it to be to be funny and humble. It's worth a listen. NOW, that the more serious stuff is over, I think I'll just link up the various songs of U2 that I love that deal with Jesus. Enjoy! That one might be a bit controversial. However, any Believer worth their salt will admit to struggling with doubt and such. If you can look me in the eye and tell me that you don't, I simply do not believe or trust you. And last but not least...and just for the cheeky fun of it.